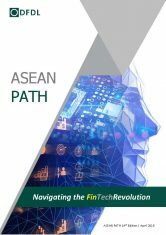 The 14th edition of DFDL’s ASEAN Path entitled Navigating the Fintech Revolution is now available for download. In this edition, DFDL reports on the current state of Fintech within the ASEAN region from a legislative and policy perspective. The ASEAN financial services sector, not unlike its other global counterparts, is undergoing one of the most notable transformations in history, the Fintech revolution. In 2016, overall investment in the Southeast Asian Fintech market grew to USD 252 Million and as of Q4 2017, total investment into Fintech in Southeast Asia reached USD 338 million. This upward trend is expected to persist throughout 2018. Certain metrics from the ASEAN region clearly point to the region’s potential to prosper from a well-functioning Fintech industry. A natural side-effect of technological innovation is disruption. Traditional financial institutions are being forced to adapt to newer business models while regulators now find themselves tasked with the challenge of grasping new technological concepts while trying to strike a balance between continued financial stability and the pursuit of on-going technological innovation.